Emily and Spencer made an effort not to sweat the small stuff. A fabulous photographer (Michelle Fiona), some stunning bright blooms and floral chandeliers (Wilder) and someone to take care of the rest (Melissa Bowman) worked out to be all they really needed to create an exceptional day. “We took it in our stride and didn’t take the whole planning phenomenon too seriously!” says Emily. 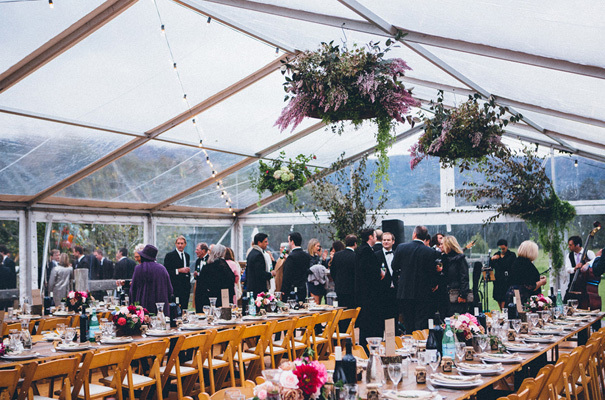 Wanting to create a relaxed, country-style wedding they picked Melross & Willow’s Estate, located only a stone throw from Sydney to host their day and South Coast Party Hire to cover any decorative must-dos that they’d missed. “Our talented friends, Hunmi and Daniel, made jam for everybody (Dan is a hatted chef! ), which acted as place cards for guests with bespoke stickers and tags as well as cute hessian detailing. Hunmi also did the seating chart… My Aunty and my Mum sewed 25 hessian sacks into covers for the hay bales and my aunty then stencilled E & S onto each of them. These acted as seats for people by the fire pit and during the drinks period outside!” says Emily grateful that her dress was a far less lengthy affair. “My dress was by Monique Lhuillier, purchased from Helen Rodrigues in Neutral Bay. This was actually the first one I had seen online and liked so I guess it was a match made in heaven’? excuse the pun! As soon as I had it on, I was ready to seal the deal.” And just like her bridesmaids Camilla and Marc jumpsuits (and the whole shebang generally), it was perfect. CREDITS Photos Michelle Fiona Photography // Bridal gown Monique Lhuillier via Helen Rodrigues // Shoes Jimmy Choo // Flowers Wilder // Rings Phillip Steel // Bridesmaids Camilla and Marc (jumpsuits) and Sass & Bide (dresses) // Grooms suit Hugo Boss // Grooms shoes Carlo Pazolini // Ties J.Crew // Ceremony St Joseph’s Church, NSW // Reception Melross & Willow’s Estate, NSW // Catering and cake Duck Duck Goose // Decorations South Coast Party Hire // Stationery Paper Tales // Hair and makeup Amelia Axton // Transport Kennedy’s Tours // Wedding planner Melissa Bowman Weddings and Events.